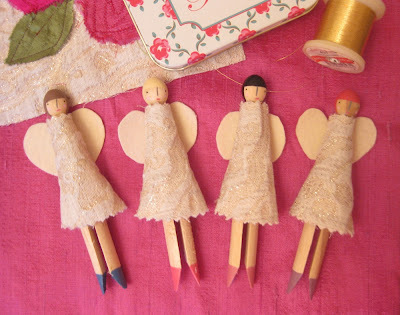 I'm starting to get ready for Christmas sales, and these are a new, festive version of my peg dolls - peg angels, which I reckon will make super stocking fillers or tree decorations. The photo doesn't quite do justice to their cream and gold jacquard dresses. Pretty glitzy eh? !